Jessica Mahoney has experienced the heartbreak and the pain that miscarriage can cause. In fact, she has experienced it six times. But Jessica finally has something to celebrate – the much awaited birth of her second child, due any day now. Have a look at the one photo that has captured the brightness and love that a rainbow baby can bring after a period of intense darkness and sadness. Six times Jessica tested positive for pregnancy. Six times she counted down the days until her due date. Six times she and her husband Kevin celebrated what was to come. And six times Jess was left feeling the sadness and the emptiness that comes after losing a baby during a miscarriage. 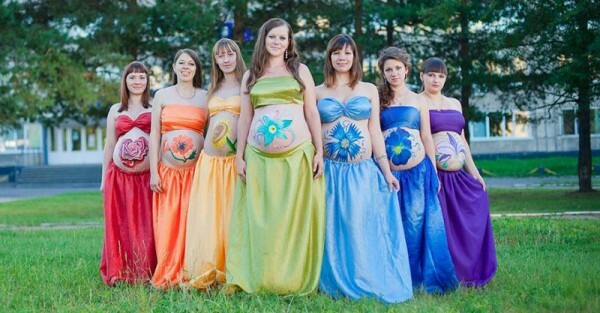 However, when Jessica’s most recent pregnancy was deemed viable, she decided to celebrate this beautiful occasion and the journey towards full term with a rainbow-themed photo shoot. Why rainbow? Because a baby that is born after the loss of another (through miscarriage, stillbirth or neonatal death), is referred to as a rainbow baby. Jessica, who lives in Connecticut, USA, gave photographer JoAnn Marrero from Pebbles and Polkadots Photography the very vague instruction to do something rainbow-inspired. JoAnn enlisted the help of her friend, Mary Maloney from From Labor to Love to ensure the photo shoot was a success. The result is simply stunning. Jessica, who already has a son, Corbin, shared her story and the photo on her Facebook page with a message to other mums who have suffered through miscarriage. Jessica and Kevin endured two miscarriages before the birth of Corbin and another four before this pregnancy. 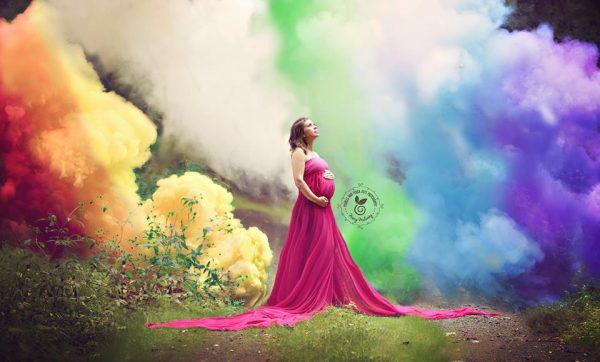 The incredible setting, the stunning gown draped over Jess’ pregnant belly and the striking pose as she looks towards the heavens to her to her angel babies above, all perfectly symbolise what a rainbow baby means to the family. 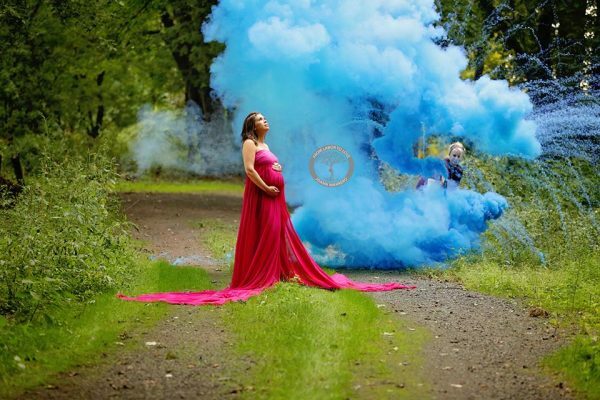 This isn’t the first time a family has chosen to blend a loss with a life and rainbow photo shoots are increasing in popularity as more and more women are speaking out about miscarriage. It is something that impacts more women than most realise and many suffer in silence. Check out our other featured rainbow baby photo shoots and our beautiful round-up of rainbow-themed finds to bring colour to this amazing occasion. October is Pregnancy and Infant Loss Awareness Month. Please take the time to read our stories on stillbirth and to help raise awareness on how we can support families who have suffered such a heartbreaking loss.